Triple the chocolate for triple the tastiness with Triple-Chocolate Cake! 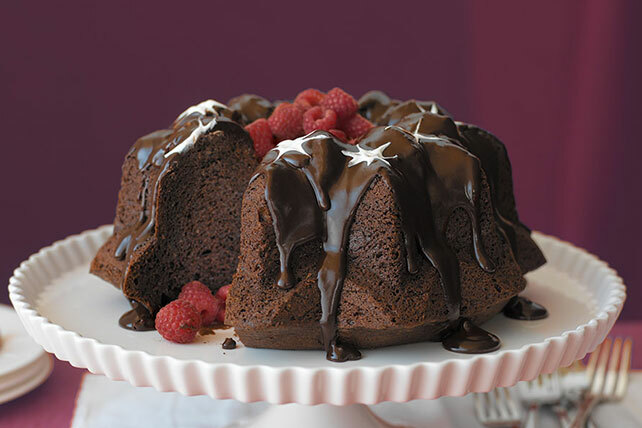 Top off your Triple Chocolate Cake with fresh berries for a yummy dessert. Beat all ingredients except COOL WHIP, semi-sweet chocolate and berries in large bowl with mixer until blended. Pour into 12-cup fluted tube pan or 10-inch tube pan sprayed with cooking spray. Bake 50 min. to 1 hour or until toothpick inserted near center comes out clean. Cool cake in pan 10 min. Loosen cake from sides of pan; invert onto wire rack. Gently remove pan. Cool cake completely. Transfer to plate. Reserve 2 Tbsp. COOL WHIP. Microwave remaining COOL WHIP and chocolate in microwaveable bowl on HIGH 1-1/2 to 2 min. or until chocolate is completely melted and mixture is well blended, stirring after each minute. Drizzle over cake. Immediately drop scant teaspoonfuls of the reserved COOL WHIP around top of cake; draw toothpick through center of each to resemble star. Fill center of cake with berries. A serving of this sweet treat goes a long way on chocolate flavor. If you don't have a traditional cake plate or pedestal plate to serve this cake on, you can use any large round plate instead. Just cover the plate with an inexpensive paper doily before topping with the cake.